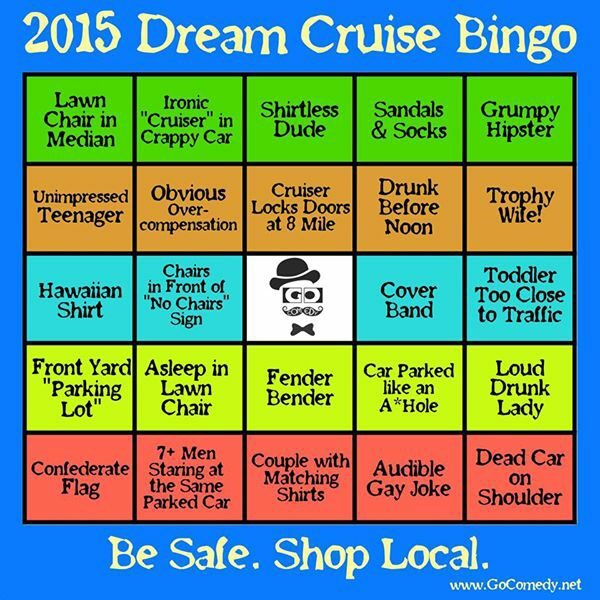 Game Time: Dream Cruise BINGO from Go Comedy! It’s Dream Cruise time again, and our friends at Go Comedy have revived a game that was started last year to make the event more interesting for spectators. Simply keep your eyes peeled for these common Dream Cruise sightings, and share the idea on social media to come up with your own interactive games! Feel free to share your observations on our Facebook Page or Twitter. Go Comedy founder PJ Jacokes is happy that people enjoy the event, but also happy to share some laughs with people who don’t like it as much. Go Comedy is one of many local venues that provides an inside, air-conditioned alternative. “I wanted to find a way to have a good time messing with the Dream Cruise without just complaining about it. Not quite the vitriol of the old Magic Bag Marquees, but still poke some good-natured fun at it,” Jacokes said. For more on Go Comedy go to www.gocomedy.net. For Dream Cruise information that is more helpful, check out the event info page at http://oaklandcounty115.com/2015/08/11/woodward-dream-cruise-aug-14-15-2015/.